A new animation series, The Deep, will premiere on 7TWO later this month. 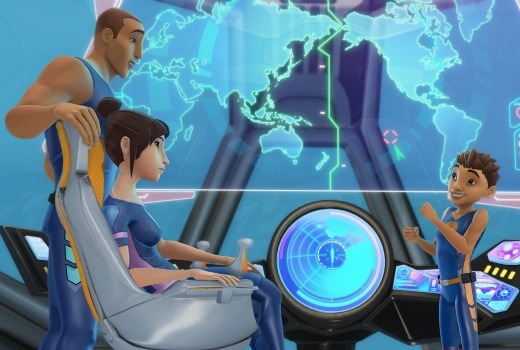 The co-production from Australia’s A Stark Production and Canada’s DHX Media is based on the novel series written by Tom Taylor and illustrated by James Brouwer and centres around daring aquanauts, the Nekton family. Avrill Stark, CEO of A Stark Production and Australian Producer of the show said, “The Deep is a spectacularly entertaining series. The characters draw us into their irresistible world of wonder, mystery and adventure. It’s an honour to be working with such a talented team and great partners”. Seven executive producer Niki Hamilton said, “The Deep’s stories are multi-layered with themes and humour that will engage children and adults alike. This is truly family viewing and we are thrilled this classy animation will premiere on the Seven Network. Our involvement underlines the network’s ongoing commitment to the commissioning of great content”. The series will also broadcast on ABC3 in 2016. Weekdays from 7:30am Monday November 30 on 7TWO. North American accents again, I assume?